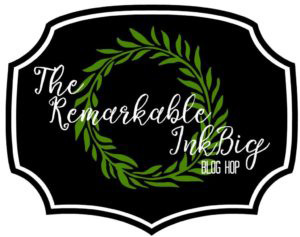 Welcome to the Remarkable Ink Ink Big Blog Hop for may. This month our theme is "Sneak Peek". We are giving you some sneak peeks of brand new products that will be in the upcoming 2017-18 Annual Catalog. The catalog goes live on June 1. You may just be starting the blog hop here at my blog, Susan's Craft Room or you may have come from the person previous to me in the list. If you get off track at any time, the full lineup at the bottom of the post will help you move along from blog to blog so you will get to see all the awesome projects. I am loving the new Clear Faceted Gems! The shimmer & shine doesn't show as well in a photo but they are gorgeous! Because the new Daisy Delight Stamp Set is in photopolymer the daisy image is easy to line up to double up the number of petals. It is stamped the new Berry Burst Classic Stampin' Pad. The Fresh Florals Designer Series Paper Stack is from a wonderful pack of papers in the 5 new In Colors. I also used a bit of the the new Berry Burst Cardstock for the tag. It is a beautiful color! The greeting is also from a new stamp set called Wood Words. 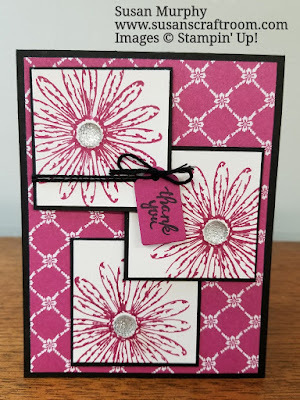 It is stamped on the Berry Burst cardstock using Basic Black Archival Stampin' Ink pad. The Wood Words Stamp Set has the cute Wood Crate Framelits Dies that coordinate with it - and the two will be available as a bundle to save you money! I used the tag framelit from the set to cut out the greeting. The greeting is attached to the top square with Basic Black Solid Baker's Twine - a returning product. To give the card some dimension, the top two squares are popped up using Stampin' Dimensionals. Below are the dimensions for the paper cuts. Fresh Florals Designer Series paper Stack: 4" x 5 1/4"
Thank you for joining in our blog hop for May! More sneak peeks are found on all the other blogs so be sure to check out all the blogs. 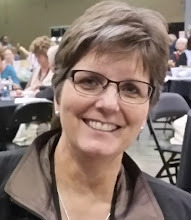 You are at Susan's Craft Room so check the blog Hop line up list to see who is next in the blog hop. Hop on over there! Great way to showcase the daisy.